Canada beat Japan 33-14 in the Challenge Trophy quarter-finals before losing 19-12 to France in the semis at the HSBC World Rugby Sevens Series event in Singapore on Saturday. 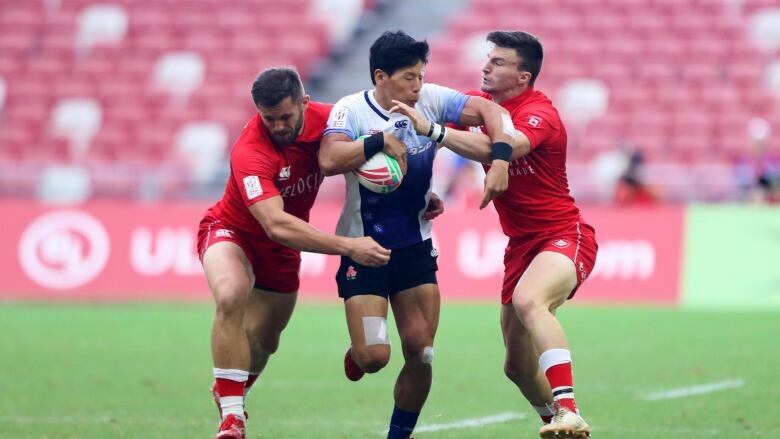 Canada ended its HSBC World Rugby Sevens Series Singapore tournament with a loss and tied for 11th place in the Challenge Trophy semifinals on Sunday. France defeated the Canadians 19-12. Canada advanced to the semis with a 33-14 win over Japan in the quarter-finals. Connor Braid, Phil Berna, Justin Douglas, Jake Thiel, and Nathan Hirayama had tries for Canada in the win against Japan. The Canadians led France 12-7 at the half on tries by Hirayama and Braid, who also received a yellow card six minutes in. But the French pulled ahead on second-half tries by Remi Siega and Tavite Veredamu. South Africa claimed the title in Singapore, beating Fiji 20-19 in the gold-medal final. Selvyn Davids kicked a penalty with seconds left on the clock to cap an astonishing rally by South Africa, which trailed 19-0 after a first half that was completely dominated by Fiji but turned the match around after halftime, matching Fiji's three tries and snatching the win with the last-gasp kick. South Africa also won in Vancouver in March. Fiji hoisted the Cup last weekend in Hong Kong. The Blitzboks stopped Fiji from becoming the first team to win the Singapore title in consecutive seasons. They beat Fiji for the first time in their last four finals meetings and shook up the overall World Series standings. The U.S., which lost 28-7 to England in the third-place playoff, retains first place after eight events on the 10-stop HSBC World Rugby Sevens Series but is only three points ahead of Fiji. New Zealand is third ahead of South Africa and England. The top four teams at the end of the season qualify automatically for the 2020 Olympics in Tokyo. Canada dropped its opener 50-12 against Fiji and was shut out by South Africa, 36-0. They wrapped up pool play with a 33-10 victory over Scotland.